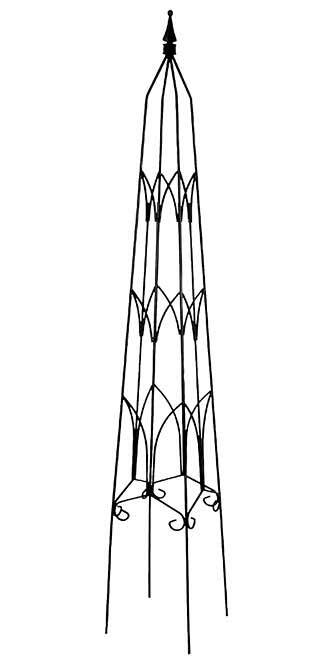 Celebrate architecture and enhance your garden with it using the Gardman Gothic Obelisk. The tall, slender shape, center support rods, and pointed arches combine to create this remarkable accent with truly Gothic detailing. The four sides of the item each have a central, vertical support, as well as dual scrolls at the base. The outward arching bars all connect to each other at their pinnacles, forming points reminiscent of medieval cathedrals. The black color adds a classic look to this obelisk, and the arrow shaped finial completes it. The four legs on the unit install into soil with ease, and the intricate pattern offers vertical support for your climbing plants. Place the unit in an 11" diameter or larger pot for added versatility and indoor style. Add a dramatic support to your landscaping using this Gothic Obelisk.